Cheesecake is one of my boyfriend's favourite things, but I don't make it very often. I'm always forgetting to grab cream cheese when I do the shopping, and when I finally do I often fall short of inspiration and forget to use it. 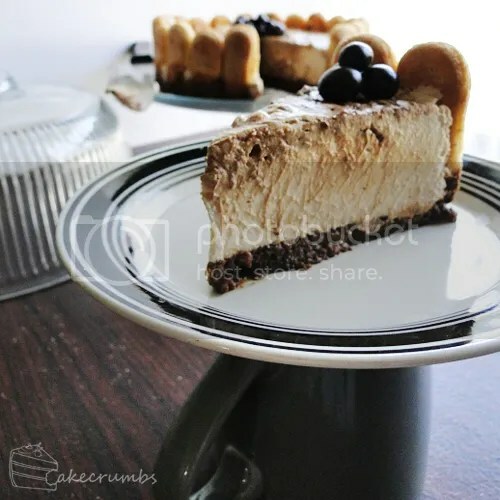 I was wondering around the supermarket picking up some random items when I came across some savoiardi sponge biscuits on special and recalled this cheesecake I'd been intending to make for a while. So I grabbed some cream cheese and some mascarpone cheese and headed straight home to whip this up. 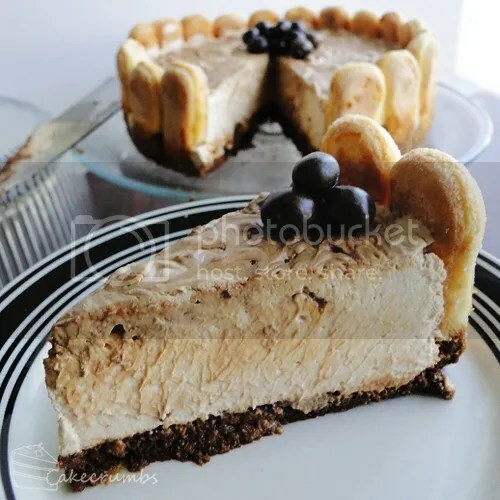 This cheesecake comes from one of my all time favourite books: The Australian Woman's Weekly's "Cupcakes, Cheesecakes and Cookies". It combines their three separate books into one, and as a bonus is cheaper to buy than buying the other three books separately. It's full of delicious recipes. 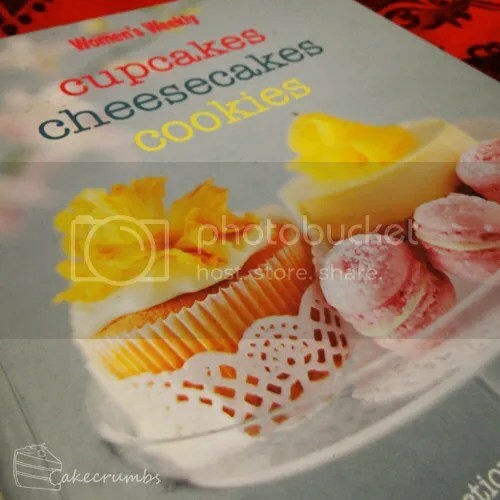 I've baked so much from this book, whether it be the whole recipe or just a portion of it. One day I will bake it cover to cover. 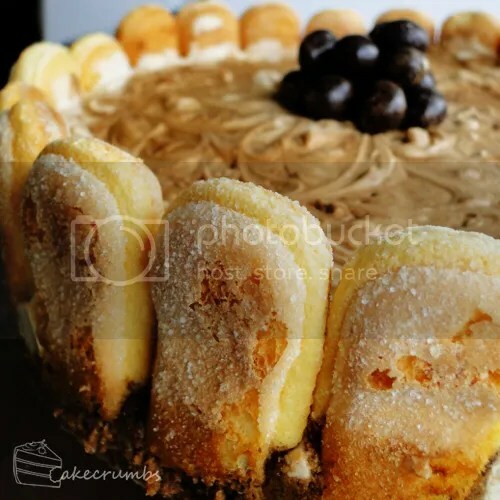 The book has both a baked cheesecake and chilled cheesecake section. I really need to make a baked cheesecake one day, but for now this is another chilled one. One thing I did change with this recipe is the alcohol. I'm not a fan of boozy cakes at all. But I am such a fan of mocha, and this packs loads of flavour even with the alcohol omitted. 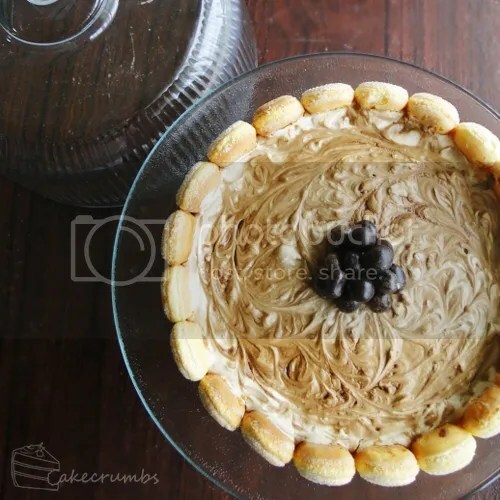 The cheesecake is drizzled with a mocha syrup, which is then swirled to give the marbled effect. It's topped with coffee beans and within a few hours is ready to serve. I was baking this late at night and so, combined with my habit for not reading recipes properly, I dipped the biscuits the wrong way. The cake held together fine, thankfully, though it lost some of the aesthetic in having the dirty bottom to the biscuits. By the time it's in your mouth, appearances are easily forgotten. Combine coffee and the water in coffee plunger; stand 4 minutes before plunging. Combine coffee, sugar and marsala in medium heatproof bowl; cool 10 minutes. Place 1/8 cup (80ml) coffee mixture into a small saucepan; simmer, uncovered, until reduced to about 1 tablespoon. Cool. Cut each biscuit into 7cm lengths; reserve end pieces. Dip flat side of biscuit lengths one at a time into remaining coffee mixture; arrange biscuits, round side out, around the side of the tin. Dip reserved biscuit ends in coffee mixture; place over base of tin. Make filling by sprinkling gelatine over the water in small heatproof jug; stand jug in small saucepan of simmering water. Stir until gelatine dissolves. Cool 5 minutes. Beat cheese and sifted sugar in medium bowl with electric mixer until smooth. Add mascarpone and marsala; beat until combined. Stir in gelatine mixture; fold in whipped cream. Spread filling into tin. Drizzle reduced coffee mixture over cheesecake, pull skewer backwards and forwards several times for marbled effect. 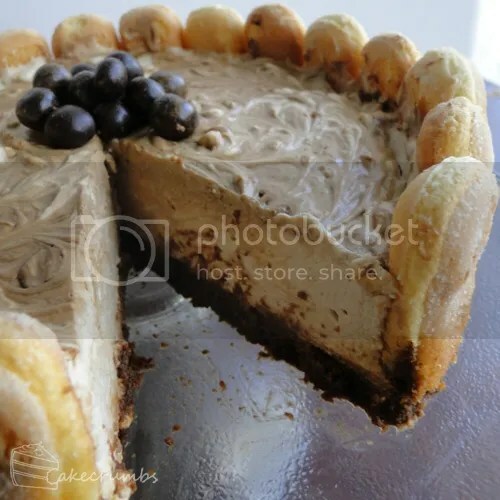 Serve cheesecake topped with chocolate-covered coffee beans. Just…..egads! I HAVE to make this. I hope it turns out amazing for you! Thanks for making this. The whole family enjoyed it!